TAIPEI — Hong Kong's Wenweipo reported that Beijing repealed a 13-year prohibition by allowing residents to set off firecrackers at this year's Spring Festival—thus, celebrating the New Year in the traditional way. Since 1993, Beijing has had a prohibition on setting off fireworks/firecrackers and residents were denied the pleasure of fireworks displays at Spring Festival celebrations. Last September, during a review of laws and regulations, Beijing deleted the prohibition in the five circuits surrounding Beijing. In these areas, on certain holidays, such as the time from Chinese New Year's Eve to the Lantern Festival on January 15 (according to the lunar calendar), residents are allowed to set off firecrackers and fireworks from 9 am until midnight. However, such activities are still prohibited on Tiananmen Square and Zhongnanhai. 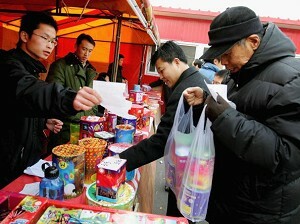 The report said that as of January 22, 2006, Beijing residents are allowed to purchase firecrackers from retailers granted special permits. The sound of firecrackers, which has not been heard for 13 long years, can once again resound in Beijing's main streets and small alleys. Although the ban on firecrackers has been lifted, there are still some restrictions. Beijing has instilled management and regulation laws, drawing up eight different regions where fireworks are not allowed. Some of these places include historic sites, bus stops, airports, and other centers of transportation, gas stations and places that are flammable, storage areas for dangerous or explosive materials, electrical and coal facilities, hospitals, kindergarten schools, nursing homes, forests, plant nurseries, and other places where fires could easily be ignited, and military establishments. In addition, the types and varieties of fireworks are restricted, and they can only be bought at certain places. This year, in the five circuits surrounding Beijing, there are 2116 places where one may purchase 657 kinds of fireworks. The report said that the entire city of Beijing has prepared 600,000 boxes of firecrackers.